Well I'm back and I hope everyone had a very nice Easter! Unfortunately I had to take a couple of days off so this post is a little late but I'll be posting about Jessica's solo work on Wednesday and Thursday as well as our joint work on Friday. On Friday morning we went to see Tom Pitman in the experimental greenhouses to discuss the practicalities of growing plants in spheres. Here we were informed of some of the limitations and problems with incorporating them into an artwork. These included that first of all we'd need to avoid deciduous plants, as these would lose their leaves and wouldn't look very aesthetically pleasing over winter. We also had to consider the practicalities of watering the plants and then pruning them so that they didn't grow out of control. We concluded that this sphere would need to be low-down and easily accessible to accommodate for the essential maintenance. Our vision was that tendrils would eventually coil around the wired supports and grow beautifully out of the sphere and around the artwork. I had an idea that instead of planting in spheres, we could grow climbing plants around the bases of the wired supports and have them coil around those alone; maybe they could even climb up and coil around the banisters in time. This would probably make maintenance a lot easier, plus we could use the sphere for something else. Other factors to consider in choosing a species would be the temperature and humidity of the atrium. Photos from inside the greenhouses. Suggestions for possible climbers included the black pepper, cheese plants and passion flowers. 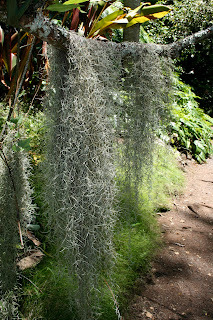 Air plants such as bromeliads and Spanish moss could also be an option. These species do not root in soil and extract their required moisture out of the atmosphere; the artist has also used them in previous work. It would however require careful moderation of the sphere’s humidity to ensure their survival. The discussion ended with a recommendation to talk to Penny Harms as she may be able to help us at the botanic garden. Tom Pitman also kindly said that he would give us a list of plants that were used on the wild walk at the harbour side to help us in our research. Later on in the day we spent the a few hours working on our models. 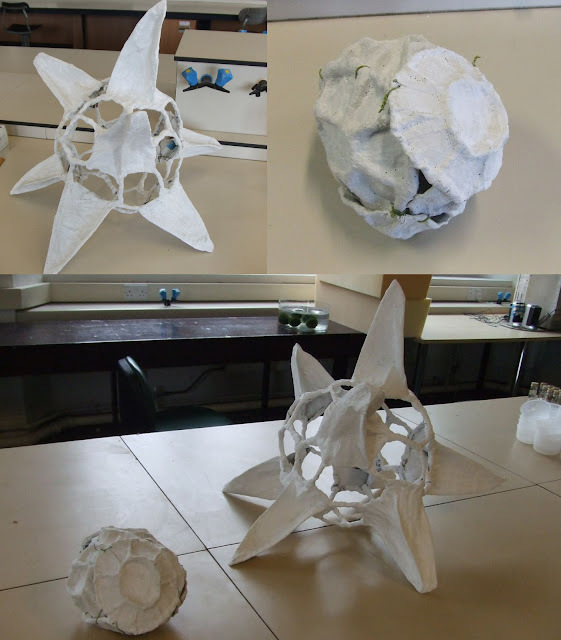 Jessica had made great progress with hers during my absence, finishing both a radiolarian and a clump of cocolithophores. 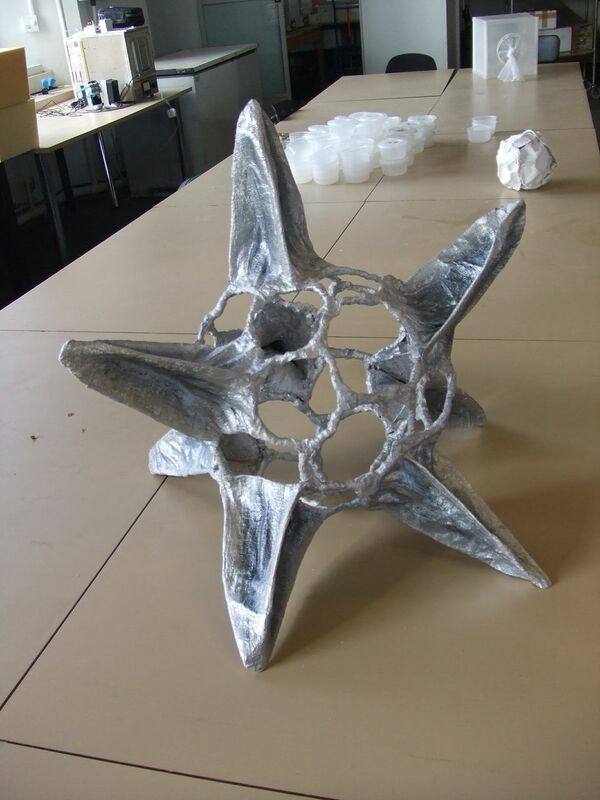 In our time today she got ahead with painting them, experimenting with a black and silver colour scheme for the radiolarian. I still had a lot of modrock to apply on my beetle and spent till near 3 o clock completing it to hopefully begin painting on Monday. Below are some photos of our progress. A comparison of my beetle after and before been modrocked. I got a reply to my email to the sphere making company, giving us a quote for the price of their products. They could make us a 200mm diameter sphere, 3mm thick with a removable cap of clear polycarbonate for £43 (excluding VAT and delivery) or a 300mm diameter for £54. The company could unfortunately not give us a guarantee that the product would survive the autoclaving procedure however, just thoughts that it likely would. Feeling that these prices were a little steep, especially with no guarantee of the product’s hardiness, we decided to investigate the glass workshop attached to the university. Unfortunately their glass blower was off sick this day but we had a chat with someone else none the less to discuss options and will return sometime next week for further enquiries. Getting the spheres from the university definitely has a positive in that they'll know a lot more about autoclaving and could likely tell us for certain how the material would behave under such conditions. The company’s product however does seem very much what we do need and it would certainly be worth considering for experiments where autoclaving was not an essential or needed at all, (if the university workshop couldn't produce a similar product for cheaper). 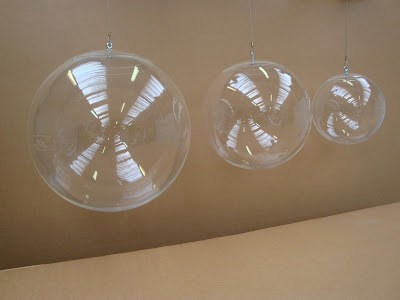 Images of the spheres that http://www.fibresports-acrylic.co.uk/spheres-hemispheres/ would produce for us. Further developments over the last few days have also included quite a few orders and more research for possible products we could obtain. Jessica ordered for us a mushroom growing kit, to the left is an image of the type of mushrooms it grows. 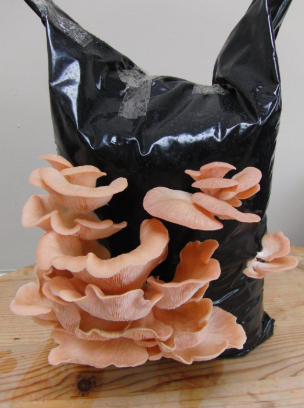 The type we bought are perhaps not the most interesting variety, however other species were both more expensive and had to be ordered from abroad which drastically increased the delivery time. We found out after ordering our beetle shells that they likely wouldn’t arrive until mid-May, so we decided for the mushrooms to order something that would arrive quickly so we could start growing as soon as possible. 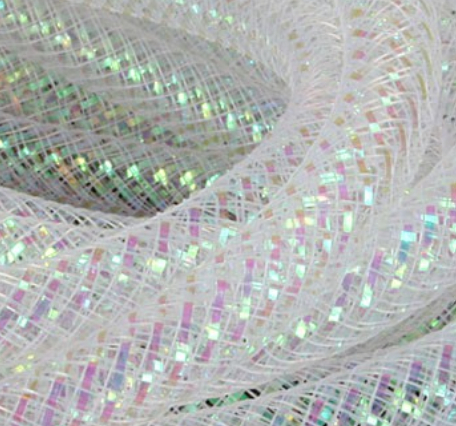 We were also looking at ordering some iridescent tubing for experimenting with the spheres' wired support. It's not a bad price of around $7 and looks to give a very nice effect. 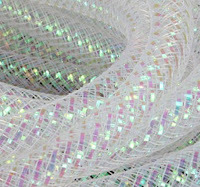 For the moment however we did purchase some thick, silvery cord from a local art shop. The moss balls have been a popular idea. Not only do they look great but they are also beneficial for keeping water free of algae by outcompeting them for nutrients. The first stand out problem as I mentioned in my last post, was that while they look great when moving around, when they come to a standstill in the water they don’t look quite so striking. This problem will hopefully be fixed by Jessica's great idea to order a solar powered motor to keep the water a little turbulent. We will be very much looking forward to it arriving so we can try it out!